Cardiff Blues belong to the Cardiff Rugby Football club. After months of negotiation between the former nine Premiership clubs and the Welsh Rugby Union, an agreement was reached in 2003 to establish a regional structure for the game in Wales. This gave birth to Cardiff Blues and the official launch event took place at Cardiff Hilton on 6th June 2003. The new region for the Cardiff Blues includes South Powys, Merthyr, Rhondda Cynon Taf and the Vale of Glamorgan. The Cardiff Blues region will extend up to Builth Wells and Llandrindod Wells in Powys and Penarth and Barry in the south. 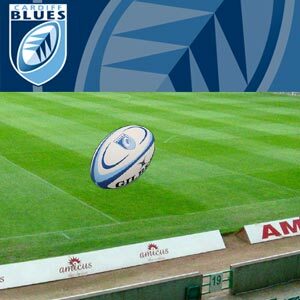 Cardiff Blues were born in the grand arena of the ever-changing Arms Park and they are set to become one of the famous names in sport, especially in rugby. The team has been formed to improve Welsh rugby fortunes at both international and domestic matches. The Cardiff Blues' region has 56 clubs including three Premier Division clubs and 67 secondary schools. These clubs will be part of a structure that encompasses a player development pathway from under12-15s district teams, regional and national under 16s schools, regional squads of under 18s and under 20s and finally national squads at under 18s, 19s and 21s, before reaching the semi-professional and professional tiers.